This book, first published in 1994, provides a comprehensive treatment of a crucial set of geopolitical issues from a region where political developments are observed with great care and some trepidation by the rest of the world. Based on expert analysis by leading researchers, the book is the first English-language to deal collectively with the origins and contemporary status of land and maritime boundaries in the Gulf and Arabian Peninsula. The 1990 Iraqi invasion of Kuwait was the gravest challenge yet posed to the system of small states established by Britain during its stay as a protecting power along the western Gulf littoral. Immediately, questions were raised about the origins of these tiny emirates: How had this territorial framework evolved? What was its raison d’être? How capable was this framework of withstanding serious internal and external upheaval such as that caused by the Iraqi invasion? This book reviews these and related concerns from a variety of informed perspectives: those of the boundary-maker himself, the international lawyer, the oil economist, and the political and historical geographer. The origins of the region’s framework of state territory are carefully scrutinised, as are the region’s borders and the contemporary disputes over their status. The period following the first Gulf War has witnessed an increase in the prevalence of Arabian territorial disputes. Some ae new, such as Saudi-Qatar, but most are established cyclical affairs. Although a complete explanation for these developments is premature, they have occurred as states in the region have been making clear moves to finalise the framework of Arabian state territory; only the Saudi-Yemen border remains indeterminate, albeit the subject of current negotiations. The book begins with a major scene-setting chapter by Richard Schofield. 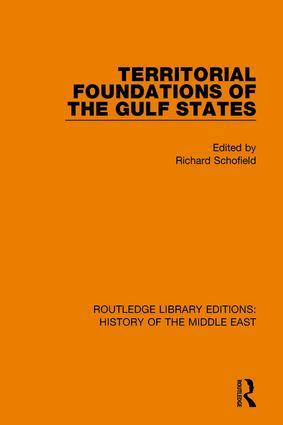 This is followed by chapters containing expert insights into the relationship between territory and indigenous notions of sovereignty, Britain’s role in drawing Arabian territorial limits (including a contribution from someone who drew up some of its boundaries), Iran-Kuwait disputes in particular, maritime boundaries, the hydrocarbon dimension, and concepts of shared political space. With many newly-drawn maps based on original research, this volume stands alone as a comprehensive reader on an issue that plays a dominant part in the regional geopolitics of the Gulf and Arabian Peninsula.